References herein are to HTT, Henry Thomas Tubbs the joint founder of Tubbs Lewis & CO, SWT his son who became Sir Stanley, CBT his grandson who worked for TL from 1912 to about 1956, war service excepted and MCT, son of CBT who worked at TL from about 1949-1956. MCT later bought the Nottingham Braid Company. CBT has left an audio memoir which is referred to here. The audio quality of the memoir is very poor, probably as a result of repeated copying. CBT’s father Percy was an architect and never worked directly for the firm. The firm acquired premises 29, later also 30 Noble Street in the City at an early date and this was leased from the Corporation of London on what was known as a perpetual lease, later converted to a 999 year lease which was surrendered after the offices were blitzed, allegedly for £4,000. Part of Noble Street sits on the Roman City wall and that part is one of the very few bomb sites never to have been re-developed. Tubbs Lewis property was on that Western side of Noble Street, 7th and 8th buildings south of what was then Falcon Square, almost opposite Oat Lane and Fitchett Court where stood the Royal Mail public house, celebrating the presence of the General Post Office at the Southern End of Noble Street. The Post Office Directory of 1856 show HTT as occupant of 31 Noble Street as a commission agent. 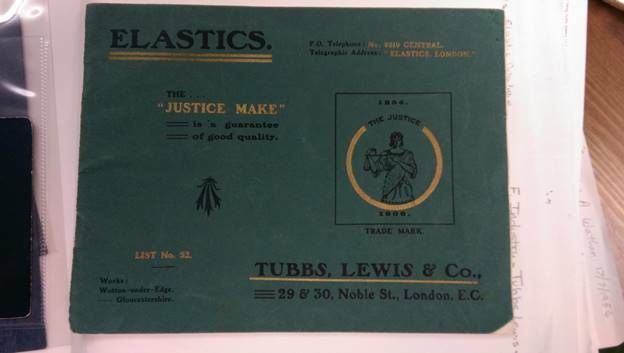 Although CBT advises that most Tubbs Lewis production was anonymous they did indeed have a number of trade marks. 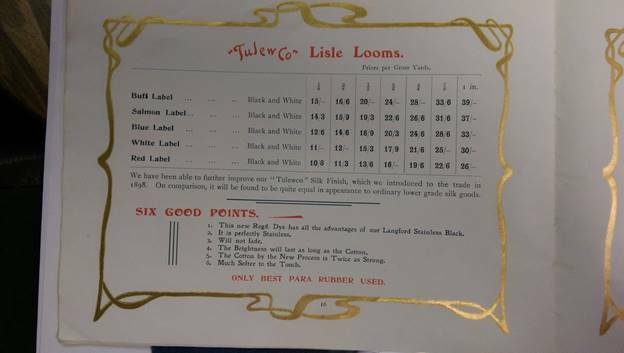 In the museum at Wotton there is an undated brochure, list number 52 of Tubbs Lewis products which mentions several of these. Only another 51 to find! Prices are quoted by the gross yards. 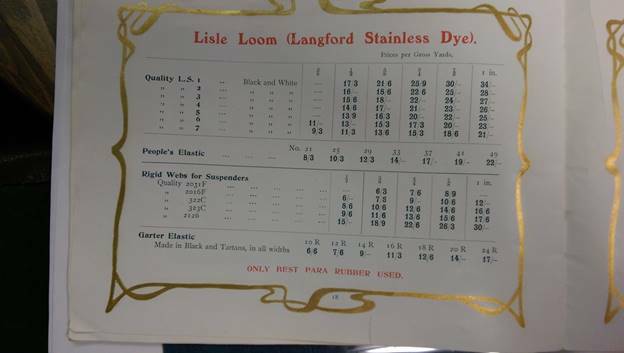 The gross, being 12 times 12, was an absolutely standard unit of measure in the narrow fabrics and many other industries until metrication in the 1960s or 1970s. MCT seriously claimed that one of his customers expected metrication to result in the sale of products by the gross metres! 100 metres is a little less than a gross yards. Another is the C-No-Pin fighting at the sharp end of the class war. These two illustrations are separate from the catalogue and later. “Tulewco” Silk Finish. This was registered design 210692. Possibly designed to be reminiscent of tulle? “The Justice Make” is a guarantee of good quality. RDTN No 168741 of 1906. 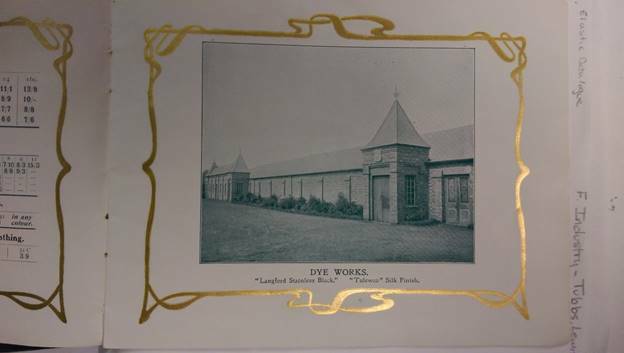 Langford Mills are designated here for Silk Throwing in the page illustrating the mills, the trade marks include The Langford stainless black – an early claim to colour fast dyeing. 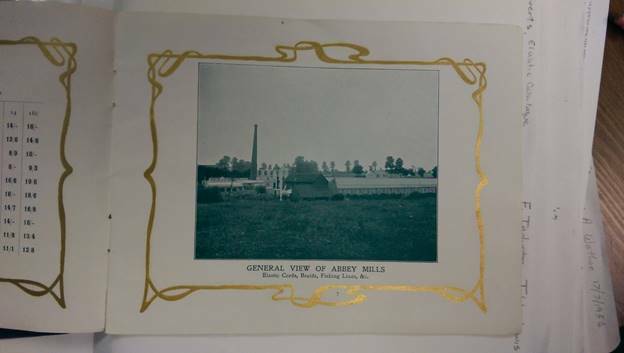 The pin mill illustrated here is probably Huntingford Mill, situated about 600 yards north of New Mill. Lambert's original business was at Kingswood Hill, now a suburb of Bristol and quite different from Kingswood near Wotton.? 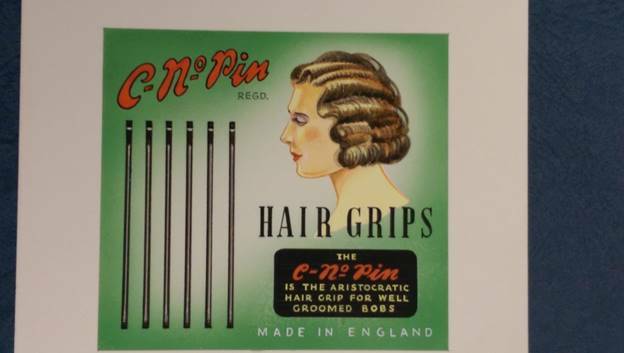 The porcupine double plated pins have registered number 271502, and Sphinx trade mark whose number is not given. 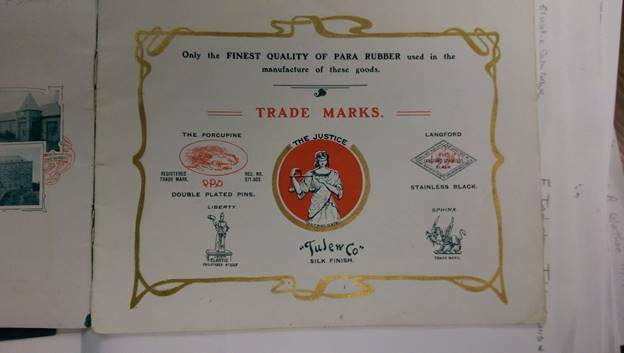 This leaves perhaps the most interesting of the trade marks, Liberty Elastic registered Number 39565. I believe this is a mark relating to the solo activity of Stanley Tubbs (SWT), earlier in his career, and his association with Irving Sandow the body builder. The Sandow connection is substantially confirmed by an entry in the brochure of the 1922 British Industries Fair. Given the known association of TL with The City, Kingswood, The Cotswolds (almost) and Noble Street, it is interesting to wonder what is the association with Warwick, The Manor and the Gauntlet. The para tree is hevea brasiliensis which leads to two conclusions. One is that rubber is heavier than air and the other is that budding planters were probably sent to a pre-para tree school. Brazilian rubber trees were imported from Brazil, cultured at Kew and then the new stock was shipped to British controlled Malaya where the new industry prospered and fortunes were made when used in real tyres as well as facilitating spare ones.. 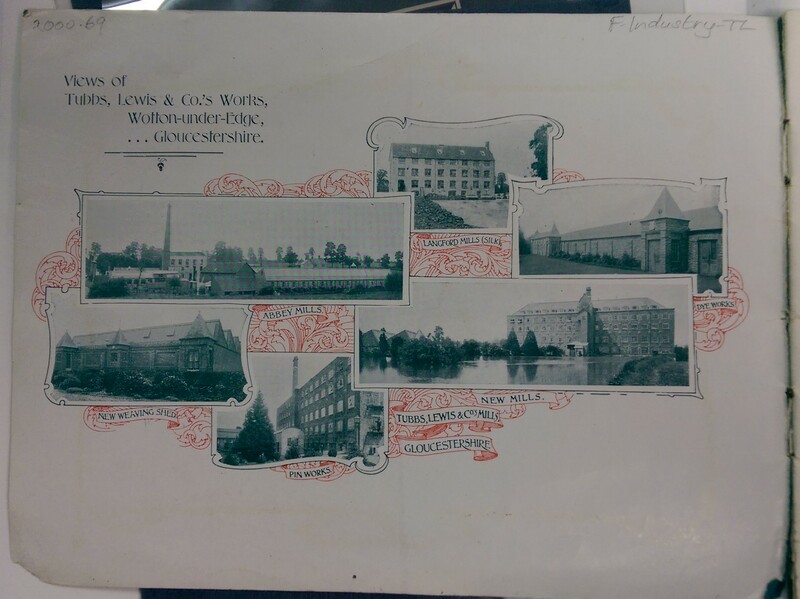 The company’s letterheading as used in 1912 illustrates seven sites including Charfield Mill for pins, using the same illustrations as above. This could be confusing as pins can be steel pins or bone-or-wooden knitting pins (always pins, never needles), however CBT’s memoir states that the business of H Stephens (or Stevens) was taken over when he went bankrupt and was run from one of the two mills in Charfield, where CBT started work for the company. The notable wooden product was the 10” junior cricket bats made for Woolworths and sold to them for 8/- per gross, which then retailed at 1d each, which is 12/- per gross, which seems like a modest mark-up by most retail standards. Beechwood stocking darners were made and sold at the same prices. Power was supplied both by water and steam; the engine was said to date from the 1851 Great Exhibition. There is a surviving complex of industrial buildings beside the little Avon on New Street, Charfield, still described as the Pin Mill, and there we are dealing with the little chaps. CBT states that the pinmakers’ trade union was the smallest in the country, with about 50 members who controlled access to the trade in the manner of the mediaeval gilds. Proprietorship of four companies is mentioned. These are: Chas Lambert & Sons, hair pins etc established 1780: E Kemp & Sons fishing lines: John Thomas & Co needles, porcupine double plated pins: James Holyoake and Co Needles. A petition to The House of Commons in 1840 (House of Commons Papers vol 26) is signed by two Holyoake businesses based in Redditch, the traditional home of needle making in the Black Country. It is said to be the source of 90% of the world’s needle production in Victorian times. These were Thomas & James Holyoake and James Holyoake. It is reasonable to assume for the moment that Tubbs Lewis later acquired the latter, but I do not yet know if it remained in Redditch. The petition relates to complaints of loss of export trade and employment after France increased import duty on needles and fishing hooks from 1 franc 10 centimes to f2.20. 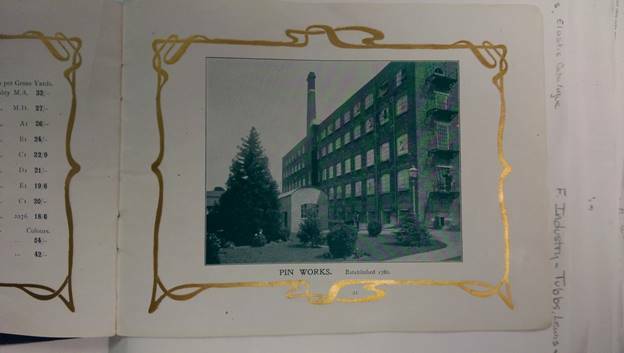 My enquiries incidentally threw up the information that there is a collecting speciality of Avery style brass needle cases, Avery being one of the principal needle manufacturers in Redditch, though I have not yet found any collectors of pins. Although Nottingham Braid used to buy needles from the Redditch Hosiery Needle Company I do not recall MCT ever making a connection between Redditch and Tubbs Lewis. T&J Holyoake are known to have produced at least one style of case, but James H is not mentioned as a manufacturer of needles or cases by some current websites. As an aside, the small community of Charfield also attracted another important but unrelated industry. The eminent Victorian photographer and publisher Francis Frith, whose images are still available for sale today, established a collotype printing works in Charfield, which was later rather improbably part of Brooke Bond; the tea manufacturers were of course very involved in packaging and printing. 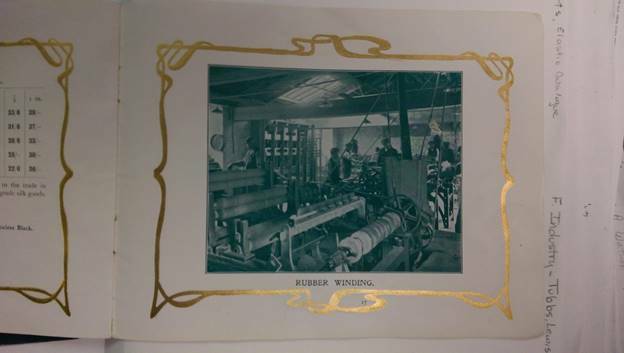 Collotype is the most expensive but extraordinarily accurate way of mechanically printing photographic images in large numbers. It is done without the use of a screen (betrayed by the image being composed of dots) and relies like lithography, which has ousted it, on the mutual repulsion of oil and water. Gravure was the cheaper process which is an intaglio method where the plate has been etched. More names from the Ikea school of branding. The Ne plus ultra must have been a bit of a deterrent to eager gentlemen! If you must ask it means no further! It is most often associated as a phrase with Wellington’s policy of denial to the French in Spain, so maybe there is a more patriotic interpretation than mine! Probably intended to mean that it couldn’t be any better which is a laudable aspiration. 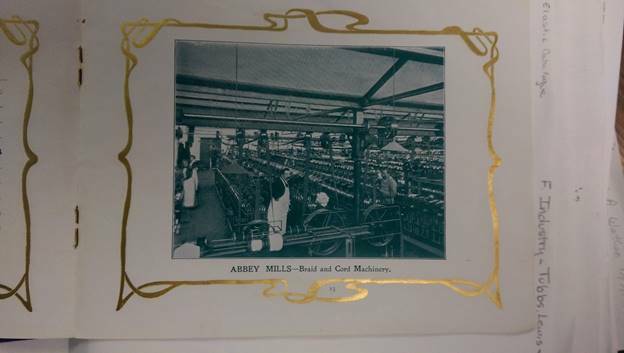 This confidently informs us that Abbey Mills was the home of Elastic Cords, Braiding, fishing lines etc. The Fishing Line business had been acquired from E Kemp and Sons according to CBT. More Black Elastics. There is a reminder here that production would mostly be sold through wholesalers or possibly agents. There is not the slightest possibility of an end user or even a department store buying direct from TL unless it was an important manufacturing account – possibly. As far as I know MCT was the first person to break the unwritten law by supplying John Lewis direct, but even then that was through a fictitious John Lewis owned wholesaler. Cords for carding purposes would probably have been wound onto small cards by a wholesaler for distribution to small haberdashery outlets. Stainless is a step on the way to the summit of completely colourfast dyes. The Textile Terms and Definitions (ed MCT) defines staining as an undesirable local discolouration. Fastness testing measures the transfer of colorant from the test material to the adjacent materials. Colour fastness is the property of resistance to a named agency (e.g. washing and light). 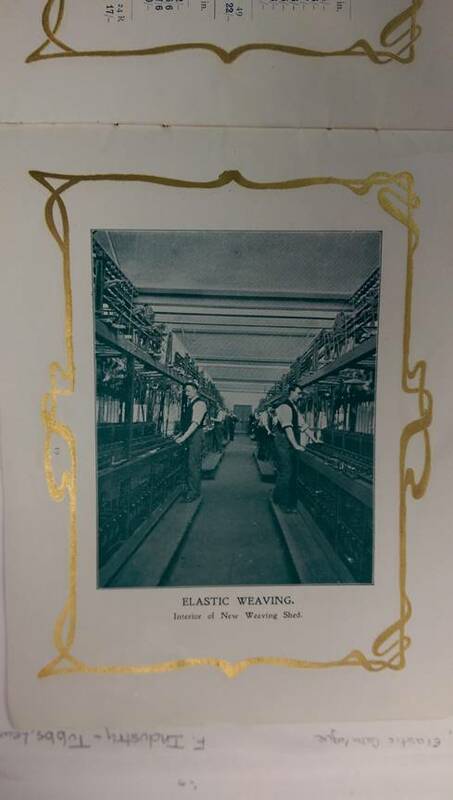 Silk finish is a silken appearance to cotton, not dyed silk, though real silks were also thrown and used in manufacture, see below. 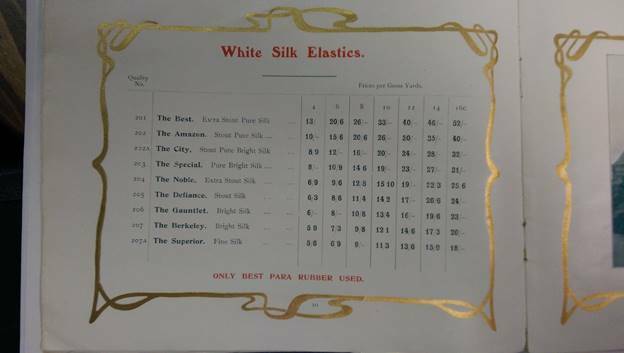 White Silks bearing the same names as corresponding Black Silks but at slightly higher prices. The appearance is achieved by bleaching rather than the addition of dyestuff. New Mill weaving shed was built in 1895. Further new weaving sheds were built in the 1950s. The illustration appears to show both braiding and cord making operations. There appear to be three double rows of Barmen style maypole lacet braiders in the foreground and some form of doubling machinery in the rear. What I can be certain of is that the noise in there would be quite horrendous. 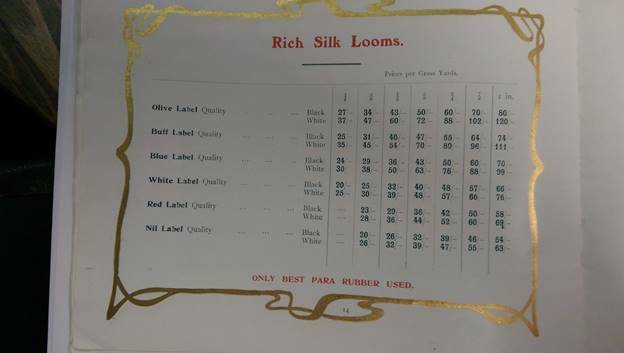 Rich Silk Looms. 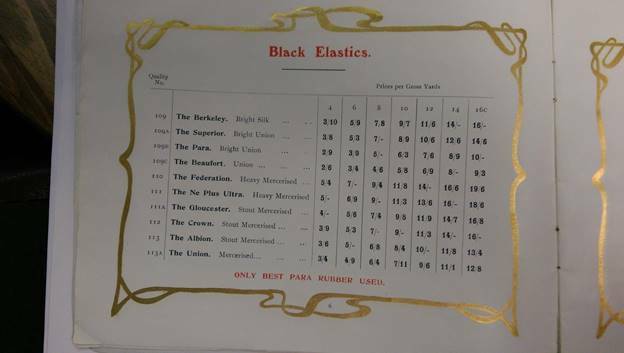 Various widths of woven elastic. It looks to me as if measuring and carding was done in silence. Six good points. Plus another one. It paid for me to go to School! More woven elastic. Lisle thread is a highly twisted, plied, good quality cotton hosiery yarn, spun generally in fine counts (TT&D). TL have been making Tulewco since 1898. Though made of cotton it is claimed to be of equally good appearance to cheaper grades of silk. Tulewco is a new registered dye. The date of registration would help to identify the date of the publication. As these are woven the different grades referred to in the label colours could reflect different warping, pick count, yarn count, or almost anything I suppose. I assume this is just being wound from one form of package to another but I can’t see enough detail. There appear to be cheeses in the foreground. Oh for a tartan garter elastic. Small boys had to wear garters on their socks even in my youth. Some were elastic and some were knotted skeins of wool to the use of which there was a knack. This appears to be men’s work. In most of the weaving trade men would tackle the looms and women would run them. 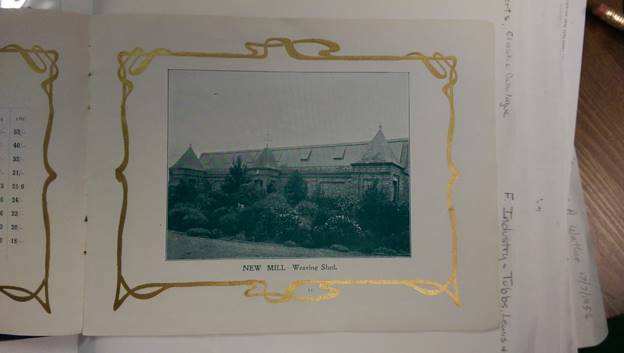 The new weaving shed was erected in 1895 but the internal evidence from the document is that it is later than 1906, so New is New as in New College Oxford. 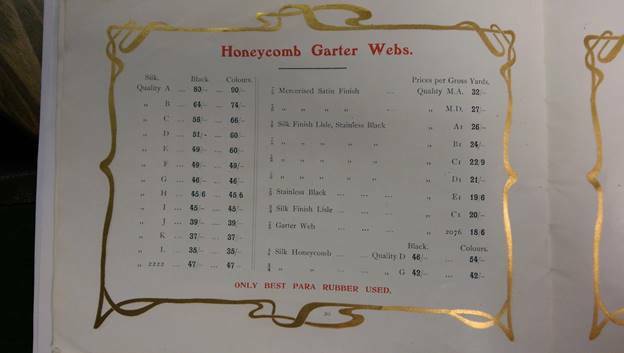 No idea what a honeycomb garter web is. Web is merely wide tape, not a particularly weave or construction. The glory of pin making is celebrated on every £20 note as the prime example of the benefits to be had from the division of labour. This photograph implies that it is the factory founded by Charles Lambert in 1790 or possibly 1780, when Adam Smith was still alive, though it looks younger than that to me and presumably steam has overtaken water power. There are older looking buildings on the site of the pin mill. MCT believed that the original pin factory had been in Stroud, but does not cite evidence. Tubbs Lewis took over the business when the then Lambert was struggling. My late aunt Ursula said she was taken round the works and was given an example of every type of pin. This collection was donated to the Gloucester Folk Museum, which itself is sited in a former pin manufactory. I have the correspondence that documents that donation. My father had a small collection of 18th century rivet headed pins, which I very badly miss. Probably without value, just pin money I suppose, they are nevertheless rather rare and a real link with the past. I have identified just one farthing pin card as used by retailers instead of change, in the folk museum at Eastbourne. The advantage to the retailer of course is that he pays less than a farthing for them. I would very much like to produce a small run of farthing change cards for the delight of my kinsmen. CBT states that cards of 100 pins were sold at 6/- per gross, however that is 1/2d each and I think he must be mistaken over the price. The card illustrated only displays 18 pins, perhaps there is room for a couple more. 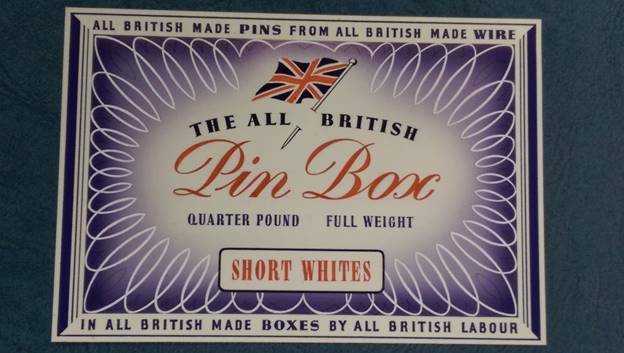 He states that 100 gross was £30.00 which is a correct multiplier of 6/- per gross (6 * 100 shillings = £30.00), so perhaps CBT is confusing a trade card of 100 pins and the smaller and cheaper farthing pin card, but that is pure conjecture. There is no guarantee that the pictured card was produced by Tubbs Lewis but given the small size of the industry and the normal laws of competition and relatively slow rates of inflation I can’t see that a TL card would have many more pins on it than anybody else’s. I sometimes think the perseverance was all mine as I had been keeping my eyes open for one of these for about twenty years. There are accounts on the internet of hands in the works inserting the pins by hand. A farthing went a little further than it would today. 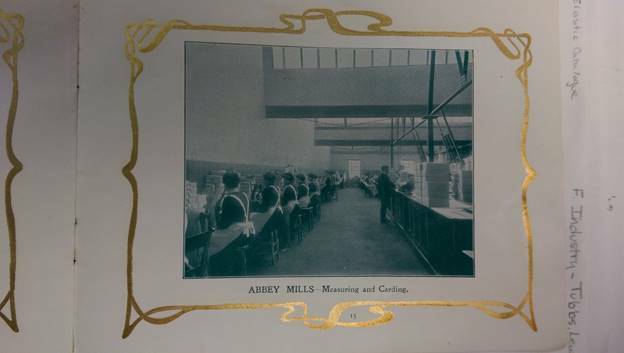 On 20th November 1933 The Times reported that Sir Stanley and Lady Tubbs had presented cheques and silver teapots to four employees who had completed 50 years’ service. The same column reports that automatic traffic lights were to be installed at The Angel, Islington – one of the busiest junctions in London.. both equally good news, no doubt. Sir Stanley and Lady Tubbs are frequently reported in The Times as attending social functions, dinners and even levees, such as a reception at Number 11 by Lady Baldwin with Stanley B in attendance, or the annual Ball at the Royal Naval College, Greenwich (18 June 1932) in the company of such luminaries as Earl Jellicoe. His involvement in the National Union of Conservative and Unionist Associations also produces several reports; likewise the Primrose League; The Bonar Law Memorial College, Ashridge. The gardens at Ellerncroft were reported as open in aid of the Queen’s Institute and District Nursing for one day in September 1938. Jo Lewis was HTT’s partner both in Tubbs Lewis the textile manufacturing business and Lewis and Tubbs, their property enterprise. According to his obituary notice in Malpas Church Magazine of September 1889 Lewis was born in Malpas, Cheshire and died there on Sunday 18th August 1889; he was apprenticed to a Mr Williams of Elesmore as a draper. They later both moved to Manchester, before Lewis moved south and worked for Acutt of Lambeth, a retail draper. 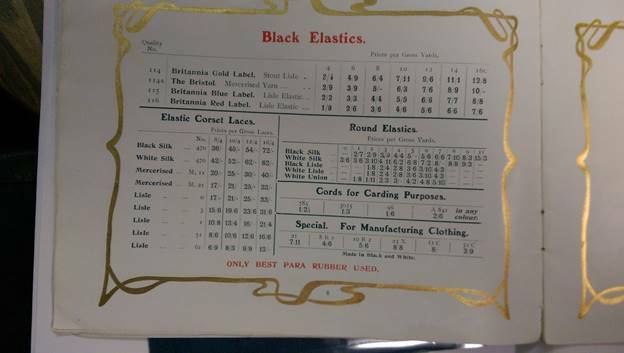 JL then took an agency for Acutt’s elastic business. In the meanwhile HTT had left Copestake and was the first man for one James Coster. Lewis bought Acutt out and at some point Tubbs and Lewis got together and went into business around 1854. 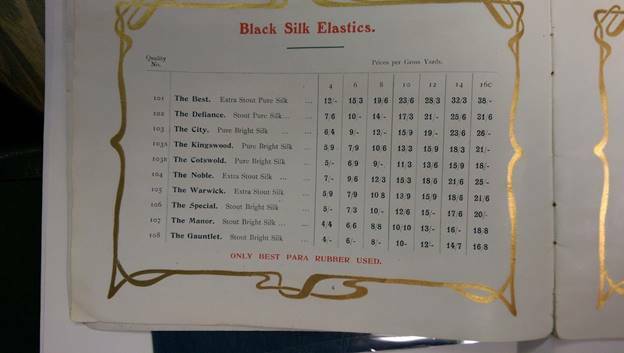 CBT states that their first factory on the New North Road in Islington/Shoreditch was set up to produce 5” boot elastic, a trade which was previously based on self-employed weaving at home. The same obituary mentions the building of the Manchester Hotel (near the Aldersgate St/Barbican station), where HTT lived for a while before building Nether Court, Finchley, and also developments on Castle Street and Falcon Square – though neither of those roads currently exist as far as I can tell - along the line of Metropolitan railway between Faringdon Street and Moorgate (1865). Further information may be available in Three Men of Malpas . Contact David Hayns, Stoke Cottage, Church Street, Malpas, SY14 8PD. According to the Daily Telegraph of 25 September 1965 TL was sold to Wolsey (of Leicester) for £450,000 of which £180,000 was in cash, the rest in shares. The net assets pre tax were valued at £752,000. Profit in in 1965 had been £80,000 against £104,000 the previous year.